I write a monthly recipe column for a Toronto based Parents of Multiples group Newsletter. The group is called TPOMBA (Toronto Parents of Multiple Births Asso) and the newsletter is called The Bulletwin. Did you know that just ½ a teaspoon of sugar lowers you immune systems function for up to 3 days? Not a great idea during cold and flu season. But if you are like me, these cooler dark days make you crave sugar. Somewhere around 3 pm until 5-6 at night I get really tired and want sweeeet. I start to root through the cupboards looking for junk. We don’t have any junk. I am a writer of all things ‘real food’ so I walk the walk and we just don’t buy it. It is these nights that I curse myself and why yes I do get nose bleeds from being so high on this pedestal…. Every year I break out the survival tactics. I make the cookies from last Septembers (2011) issue which I know you still have because you have torn out every recipe column and pressed them gently into the pages of your diary. (Or you can go to my website www.lifeastudy.ca and look at the recipe column page and scan down to the right issue). I always have a large container of cut up fresh fruit to eat with yogurt and my homemade granola (also on my website) and I make ‘Nut Dust’. I know they may not sound like they would be sweet enough to kill the craving but they are more than sweet enough…….and healthy!! The fats and fiber in the nuts and coconut oils slow the absorption of the sugar and don’t spike your blood sugar level. And ‘sugars’ like maple syrup and honey are always better for you because of the micro-nutrients and minerals they contain. Refined white sugar contains nothing of any nutritional value but you smart Mamas already knew that. Line a cookie tray with parchment paper. Mix the melted oil into the maple syrup, and add the salt and cinnamon. In a large bowl coat the nuts with the wet mixture and then pour onto the lined cookie sheet. Roast until the nuts have become crunchy and the sauce has thickened. Let cool. Once cool the sauce should no longer be a sauce but candied and hard. Break it up and blend in batches in a food processor. Blend until the consistency of sand. **If you over blend it becomes nut butter…not the goal but equally sweet and delicious destination. Happy Halloween and Happy Birthday to my Twins Gabriel and Beatrice. They will be five at the end of October……FIVE!! I say it every year but how did that happen? It doesn’t seem like 5 years could have possibly passed but I also have no recollection of life without them….could it be that I still have baby brain? They surprised us, born in the wee hours of October 27th, 7 weeks too early. Although I wish they had made it closer to their due date, which was just a little too close to Christmas than birthdays should be I think, they did manage to be born close to the coolest holiday to have a birthday on. Halloween offers endless fun birthday theme party ideas, fun crazy foods, costumes and candy! It really does make planning a party that much more fun. There are no other holidays that would offer up so many awesome ideas. Who else has a birthday that you dress up in costume for and then go door to door getting candy? Just The Johnson Twins. At least this is what they think. They think the whole neighbourhood decorates for their party. They think Halloween is all for them!! And after the drama of their early arrival, the close call on the survival of one of them, who am I to say that it isn’t all for them? I kinda think it should be. I love the campness of Halloween party foods. They are all so creative and fun. I am no expert on creating these. I offered up some of my own creations in The Bulletwin’s October issue last year but I will whole heartedly admit that I turn to the master of themed parties, the Honourable Grande Dame - Martha Stewart. Here are but a mere few of the amazing Halloween party recipes from her website. I have made all of these with great success. 1. Preheat oven to 475 degrees. Roll out dough, and use a paring knife, scissors, or cookie cutters to create features. Brush with oil, and sprinkle with salt. Bake until "ghoul-den," 10 to 12 minutes. When tasty bow-tie pasta and melted mozzarella become bats and cobwebs, you know it's a Halloween dinner. Preheat oven to 400 degrees. Cook pasta according to package instructions. Drain; set aside. Meanwhile, in a large saucepan, heat oil over medium. Add garlic; cook until fragrant, about 1 minute. Add tomatoes, oregano, and sugar. Bring to a boil, reduce to a simmer; cook, stirring and breaking up tomatoes until slightly thickened, 5 to 8 minutes. Season with salt. Add pasta, sausage, and half the mozzarella; toss to combine. Transfer to a 2-quart baking dish. Top with remaining mozzarella and Parmesan. Bake until bubbly and top is lightly browned, 10 to 15 minutes. Mix blue cheese with 2 or 3 drops of blue food coloring, if desired; combine with softened cream cheese. Roll into a log, and wrap in plastic. Refrigerate until firm. Unwrap, and roll log in black sesame seeds. Serve with crackers. We have had a crap summer. I don’t mean the weather has been crappy. You all have had the same beautiful hot weather as me….no it isn’t the weather. It has been more that everything that could go wrong ….has. I am really not pulling a ‘oh woe is me’.. I am serious…..everything. Car break downs, bank cards that stop working at incredibly inopportune times, unforeseen expenses, two family holidays ruined – one when my husband gets hospitalized with a severe allergic reaction to poison ivy (in the US) and the other, a camping trip, that gets cut short by an emergency 10 days long business trip – it almost seemed like a good thing at the time because I wasn’t feeling well and not up to camping but when I had almost a week left of single parenting with what was later diagnosed as swine flu and strep throat…….you catch my drift…..it has been a looooooonnnnnnng summer here in the Johnson house. By the time the September Bulletwin is snug in your hot little fists, hearts beating with excitement over the new recipe column issue, it will be fall and my kids will be happily (my happiness) back at school, giving me 2 ½ hours a day of mini vacation. Yes I have endless writing to do to catch up for all the ground I lost over the summer, and yes I have housework and mounds of laundry and cooking etc but I plain to claim a little me time….a little time to make up for the vacations that never were…a little time to close my eyes and listen to the quiet that so rarely exists…..while I soak in the tub…..probably with all my hand washables to save time…. Over medium-high, heat remaining oil in large cast iron skillet. Brown the pork on all sides. Remove from heat and set aside. Discard any excess fat in the pan and reduce heat to medium. Add garlic, chilies, and onions and cook until soft, scraping up any browned bits from the bottom of the pan. Increase the heat back up to medium-high, add back the pork and pour in the beer. Bring to a boil, cover and transfer to oven or slow cooker. Cook until pork is tender and falls apart, about 3 hours in oven or on high heat in a slow cooker, longer on the lower heat settings. Remove pork and strain the liquid, removing any excess fat. Shred pork with two forks and add back to the liquid. Add vinegar. Serve on soft buns with a creamy coleslaw, potato salad and BBQ corn and you have a true southern BBQ. 1-2 tbsps a neutral tasting oil like grapeseed or a more refined coconut. I was amazed how good this is….I was amazed how many different ways I could use it. Not just as a nut butter replacement but as a dip for apples, in smoothies, in baking, sweet and savory – think veggie burgers with sunflower seed sauce. I have been sick. The kind of sick where the bad news is you’re gunna live. I haven’t been this knocked down in many years. I woke everyday feeling the same as the day before. Never better and occasionally worse. This dragged out for weeks. Through the clothing sale, March break and well past Easter. I went to the doctor concerned that maybe I had some sort of underlying infection but I was given the all clear. Just some terrible virus he said, the flu perhaps. This was the first time in a long time that I was sick enough that I really felt I needed to pull out all the stops. Like any parent will admit, there just isn’t time to be sick and certainly even less time to look after your self. It was time to get serious about getting healthy. There are things we can do for our immune system, things to boost and support like Vitamin C and D. And things we can do to not ‘feed’ the virus like cut out dairy and wheat – both contribute to mucus production. I read once that a ½ tsp of sugar (this includes natural sugars like honey and maple syrup) can suppress the immune system for up to 3 days so they had to go too. So how do you make wonderful good for you broth/stock?? You have come to the right place. Start by roasting and browning up your meaty bones. Place them in a roasting pan and brown at 350 degrees for about 20 minutes. This adds flavour and colour. Now add your now browned bones in to your stock pot with the rest of your bones, water and vinegar. Let this sit for an hour. Meanwhile, pour off the extra fat from the roasting pan and deglaze with fresh water, scraping up any brown bits from the bottom of the pan. Add this to your pot along with the vegetables and bring to a boil. A large amount of scum will come to the top, skim this with a spoon. After you have skimmed, reduce heat and add the thyme. Remove bones and strain stock into a large bowl or pot. Let this cool and then refrigerate. Doing this will let the fat rise to the top and congeal making it easy to remove. Freeze your stock in yogurt containers. Use for making soups and stews, rice, casseroles or stirfrys. Drink mugs of it when sick and you can actually feel yourself getting better. Noodle and sauce was the first thing I learned how to cook. I remember shopping for the ingredients with my mom, a bag of fresh pasta, canned tomatoes, a knob of cheese. It was my favourite meal - Me, mom and our simple dinner. Isn’t it funny how much better everything is when everyone loves the meal? The conversation is better, you laugh more, the mood is lighter. There is no need to remind little ones to stay seated or that they will be hungry later (no there won’t be a snack later Beatrice!!) if they don’t eat their dinner. There is some ease, like a deep breath…a perfect dreamed up movie like family meal. So how about an equally easy homemade sauce? 2 28 oz or 796ml good canned tomatoes or 2 home jarred (the quality of the canned tomatoes can make or break this. Cheap canned tomatoes can taste acidic and tinny. It really is worth it to spend the money on good tomatoes, especially for this sauce that has very little other ingredients. I prefer tomatoes packed in pulp not juice). Cut it open and scoop out the seeds with a spoon. Depending on the size you may want to cut it into quarters. Put these straight into a large pasta pot, fill with water until the squash is completely covered, salt the water and leave to boil. There is something else you can do...cook the squash and noodles in the same pot - fill the pot with a lot more water than just covering the squash and when the water is boiling add the noodles and cook normally. When the noodles are done dump the contents of the pot into a strainer, squash and all. Set the squash aside and let it steam dry. This helps remove the excess water from boiling it and avoids the squash from watering down your sauce. Once it is reasonably dry (just not dripping) shred it with a fork. Then combine the shredded squash into the sauce, toss with your noodles and top with cheese. Then take that deep breath and maybe pour a glass of wine. In our ever growing attempt and need to eat healthier, save at the grocery store and tread lighter on the planet I have been trying to cut back on our meat consumption and up the vegetable content of our meals. This proves difficult with my meat lovin’ husband. So instead of having too many completely meatless meals, which he would complain about, I have cut way back on the quantity of meat each meal has. Think meat sauce pasta instead of a steak. Making soups, stews, currys and stir frys are one way to do it, adding a source of vegetable protein is another. The challenge is cutting back on the meat without increasing the quantity of simple carbs ie. Filling the gap by pigging out on more pasta, rice or bread which nutritionally have little to offer. I didn’t grow up eating much in the way of beans and lentils. My mom makes a pretty mean baked beans which I now make on occasion but I don’t remember much else. So this has been a sincere challenge for me. Learning the ins and outs of cooking beans and the results and benefits of eating lots of beans – Result: your rear ends will become an alternative heat sources for your home Benefit: your kids will think it is hilarious. My favourite way to make these is in a slow cooker (easier and I don’t have to watch as closely) but you can do it stove top if you can turn the heat down low enough. I really love that I can start these in the morning and leave them gently bobbing away until dinner time. HINT – This makes a pretty huge batch - freeze some. In a colander, rinse beans well with water. Pour the beans in a large pot with 8 cups of salted water and bring to a rolling boil over high heat. Lentils are a great source of protein and oh so tasty. I first made this as part of a big curry dinner night with guests (I cook a lot of Indian food) and was surprised how super easy and totally delicious it was. It has now become a bit of a regular at our table. The cooked lentils themselves are not spicy and great for kids of all ages. It is the topping that adds the kick. You can cut back on the heat by cooking the topping with little or no chilies for the wimps among you. HINT – double or triple the lentil part of this recipe. Great leftovers and freezes well too. The topping should be done right before serving. Put the lentils, water, turmeric, cumin and salt into a sauce pan and bring to a boil. Reduce heat to medium and cook uncovered for 8-10 minutes, stirring frequently. Now cover the pan and simmer for 30 minutes, stirring occasionally.. In a fry pan melt the butter over medium heat and fry the onion, garlic and red chili until the onions are well browned, about 8-10 minutes. Serve with the option of topping with the spicy garlicy onions. Serve with fragrant rice (see May’s Bulletwin) and a dollop of yogurt. I have always really enjoyed the POM meetings. Not only are my questions answered, which is invaluably helpful, but I have always found a ‘been there’ camaraderie to be a great boost to my confidence as a parent and any sense that I may just yet survive this. In the last year there has been a great shift in the tide (did you feel it?) where I became one of the parents at the meetings with the older kids….finally (slightly) qualified to be an advice giver and not just a receiver. This feeds heavily into my ‘know it all’ image and boosts my ever failing self-esteem…..but seriously….it feels good to give back! Every meeting, every month the same question comes up “Any ideas for finger foods?” and every month we pelt the parent with answers. It seems that we all hit a wall in our creative cooking mind before the kids master the use of a knife and fork. Don’t forget to introduce more complex flavours as they get older - adding herbs, garlic, onions, lemon and even a little spice to dishes, sauces and dips. Even just cinnamon in apple sauce! With the twins having started school this past September not only has their social life taken off so has mine. They have play dates, parties and park dates with their new friends and I have tea talks, lunches and coffees in the park with mine. Now I have a big network of moms, dads and child care workers looking out for my kids and know who they belong to and where they live. It does ‘take a village’ and with very little family near by I am glad to be creating ours. Recently another mom tried to make plans for a group of us to take all the kids to McDonalds for lunch. I bowed out claiming a bad choice of day. But they rescheduled to accommodate. I finally had to admit that we don’t eat McDonalds. My kids have never had fast food other than a few road trip french fries. I always feel bad saying this, like our choice to not eat fast food judges their choice to eat it. There have been many factors in our decision to avoid the temptation. It helps that I like to cook, I have Celiac disease and that I have read everything that Michael Pollan has ever written. Read The Omnivores Dilemma and you will find yourself stepping away from convenience foods or like in my case, run screaming. “Of the thirty-eight ingredients it takes to make a McNugget, I counted thirteen that can be derived from corn: the corn-fed chicken itself; modified cornstarch (to bind the pulverized chicken meat); mono-, tri-, and diglycerides (emulsifiers, which keep the fats and water from separating); dextrose; lecithin (another emulsifier); chicken broth (to restore some of the flavor that processing leeches out); yellow corn flour and more modified cornstarch (for the batter); cornstarch (a filler); vegetable shortening; partially hydrogenated corn oil; and citric acid as a preservative. A couple of other plants take part in the nugget: There's some wheat in the batter, and on any given day the hydrogenated oil could come from soybeans, canola, or cotton rather than corn, depending on the market price and availability. So I invited them all over for lunch instead. Season the chicken with salt and pepper. Stir up the mayo, egg white and mustard. Coat chicken in mixture and press into crushed up crackers. Bake until chicken is cooked through. In a large bowl cover potatoes with hot water and soak for 10-30 mins. Drain and let dry. Return to bowl and toss with oil. Arrange in a single layer on a baking sheet. (If you cut larger wedges wrap tightly with tin foil and bake for 5 minutes before removing foil. If you cut them smaller skip this step and put them directly in the oven.) Bake until the bottoms are beginning to brown (15-20 mins depending on size) Flip and bake for 5 -10 minutes more. When done transfer to a papertowel to remove any excess oil. Season with salt and pepper. I spent Friday night helping set up and was back again helping running the sale early in the morning. I rushed from the sale to another kid's birthday party where my husband and kids were already elbows deep in cake. We made it home in time for an early dinner and bed time. I woke Sunday knowing that we had to host a lunch/dinner little birthday celebration for my Father-in-Law. It had already been such a long weekend (but not in the extra day kinda way) and I can't say I was dying to get cooking. Luckily for me, my husband had taken care of the dessert making so all I had to do was the lunch/dinner…..and clean the entire house. 2 796 ml cans of Plum Tomatoes, one entire can and one drained of its liquid. In a large pan over medium high heat sauté the onions and peppers in 2 tbsp of the olive oil. Just as they soften add the garlic being careful not to let it burn. Once soft remove from pan. Add the remainder of the oil and add the chicken. Let the chicken sear and brown a little. This will save it from falling apart when the liquid is added in later. Once all the chicken has changed colour but without letting it cook through, add back in the onions, peppers and garlic and 1 cup of the chicken stock. Bring it to a simmer and add the tomatoes, squishing and breaking up the tomatoes a bit in your hand. Add the thyme. From here let it simmer until the rice is ready. First rinse rice well with cold water. Wash until the water is relatively clear. Put the rice and liquid (try 3 cups of stock, 3 cups of water and you will perfectly use up the tetra pack of stock)in the pot and bring to a boil. Once boiling turn the heat down as low as your burner will go. Make a tight seal with a piece of tin foil between your pot and the lid. Leave it like this for 20 minutes then turn the heat off and let sit for 5 minutes. Remove the lid and very carefully remove the tin foil and fluff rice with a fork. Does everyone go completely over-board on their kid’s birthdays or it just me? I feel some enormous obligation to pull off two birthdays at once…..it is TWO birthdays and I should make a suitable fuss….right?. My kids were born on October 27th (yeah they turn 4 really soon!!) which gave me an instant birthday party theme – HALLOWEEN!! How is a Halloween themed birthday party super cool you ask?…where do I begin?? Great decorations, fun activities, costumes, millions of fun food ideas…and it is a theme they will never grow out of! 1. Preheat oven to 250˚ degrees. Line a baking sheet with parchment paper; set aside. In a medium bowl, mix together lemon juice and salt; set aside. 2. Peel apples and cut each in half through the stem; remove seeds and core. Using a sharp paring knife, carve a face, as desired, on the rounded side of each apple half. Place apples in lemon mixture for one minute; transfer to paper towels to drain. 3. Place apples, face-side up on prepared baking sheet and transfer to oven. Let bake until apples are dry and begin to brown around the edges, about 90 minutes. Remove apples from baking sheets and press cloves into the "eye" sockets or use as teeth. 4. Warm cider in a large pot; float shrunken heads on top to serve. 1. Place eggs in single layer in a large saucepan, and cover with water and blueberries. Bring to a boil. Remove from heat. Cover; let stand 10 minutes. 2. Using a slotted spoon, remove eggs one at a time, and place on a folded kitchen towel. Lightly crack shell on side with the handle of a whisk or a wooden spoon. Transfer egg to medium bowl; cover with cooking water. Repeat with remaining eggs. Let eggs cool completely in water in refrigerator. 3. Carefully peel shells from eggs. They will have veins of blue and if you cracked them right it can look like spider webs. You can enjoy them now or carefully slice them in half putting the yolk in a separate bowl and placing the eggs on a platter. 4. In the bowl of yolks add the mayonnaise and mustard and combine well. Mix until completely smooth. Salt and pepper to taste. 5. At this point you can have a little fun with food colouring making the deviled egg filling a disgusting colour. The yolk and mustard have already made it quite yellow so adding a bit of blue makes a wonderful horrible green. Spoon or pipe it back in to the egg and garnish with chives and paprika. 4. Once your ‘meatball’ is cool enough to work with lift it careful and place it in the middle of your pasta pressing it down into it slightly. Now it is time to start creating your ‘Mummy”. 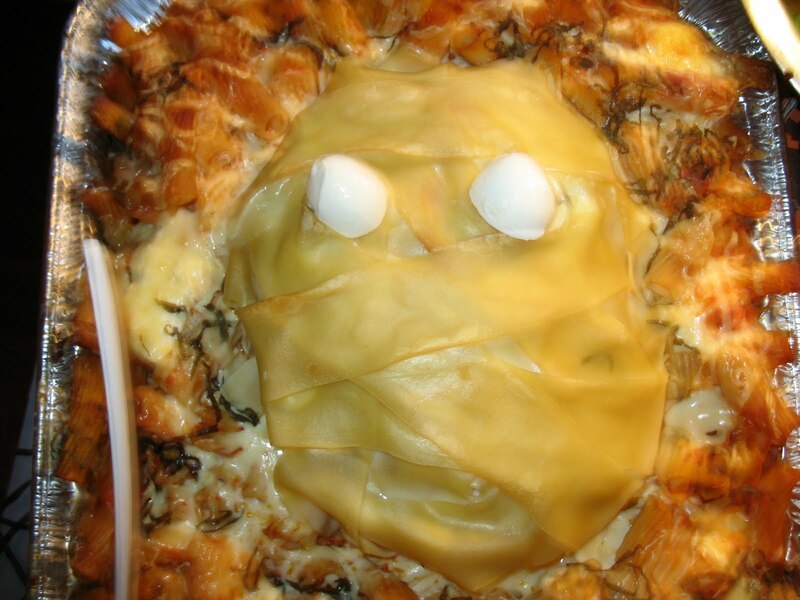 Layer the face with the lasagna noodles to create mummy bandages. 6. Once done use the one boccocini ball cut in half to create the two eye balls. In February when it was time to enroll the twins in kindergarten I started to panic. I was concerned if they were ready and more importantly if I was! I have been a work-at-home-mom their whole lives and I started to panic at the idea of not just their lives changing so much but MINE! What was I going to do with the time? (They are going into a half day kindergarten class so I am looking at having about 2 hours to myself which makes this all the more ludicrous) In panic I started reading about the benefits of home schooling and/or holding them back a year, or how about ‘unschooling’? or even how to become a Montessori teacher. My husband watched me spin out of control trying to find ways to not have to let go no matter how little letting go there might be. He just kept telling me “they’ll be ready”. Now half way through summer (at the time of writing this) I have watched them grow so much since February and I can fairly say, I think they are ready. I haven’t really had to ‘let go’ as so much as they are letting go of my hand and being braver, running further, making friends, and climbing higher. I have to trust in what we have taught them so far and let them conquer some challenges on their own. No I still can’t say I am ready but it has been interesting thinking about who I might be or could be with an extra two hours a day. Maybe my house will be cleaner, maybe the laundry FINALLY gets done, maybe I read more, work more, watch more tv or maybe the only thing that changes is how much time I spend outdoors with my thoughts…..because that is something I could do outside the school with my nose pressed up against the window right? When I was in grade school parents would come into the playground to pick us up. One boy who was a grade ahead me was almost always picked up by his grandmother. Most parents would stand in clusters chatting and waiting, Gramma would stand off by herself holding a cookie over her head. I am NOT suggesting this is how to pick your kids up but if you do here is a very healthy cookie. I got this recipe from a friend who is a Certified Holistic Nutritionist. I make if often and we all love it. It was the norm to come home and see Mom cooking dinner. Classic British fare, roast meals, over cooked vegetables and endless casseroles. I always knew it was spring and something that wasn’t on the regular menu was for dinner when I saw my Dad at the BBQ. BBQing has always felt like ‘mans work’, it’s primal, ceremonial, and tribal. I always helped my Dad on those nights, learning the ropes for when it would be my turn to be ‘the tamer of the flame’. I also just loved the time with my Dad. Two guys talking about their day, burning meat and the occasional stolen sip of my dad’s beer. Now that I am the Dad of the house, I take my BBQing responsibilities very seriously. I like the nights when dinner is my responsibility but love them during BBQ season. I still love the simplicity of cooking over an open flame outside. Playing with the kids in the back yard with the smell of charcoal and sizzling meat hanging in the air. And maybe, just maybe when no one is looking I’ll pound on my chest a little. Mix all the ingredients together trying to not over handle it. (Makes it tough) Press into patties. There is a trick to cooking meat on a grill. The patty isn’t ready to be flipped if it sticks to the grill. Don’t flip any meat until it releases itself. And try not to play with it, flip it once. Slice up everything and toss into a bowl. Lightly coat with olive oil and sprinkle with salt and pepper. Grill everything until soft and browned. We have founds that the kids like peppers better without the skins…..so does Emily really. Toss the peppers into a separate bowl right off the grill and cover with plastic wrap. Let them steam in there for about 10 minutes. When you pull them out it is easy to slip the skins off. (Emily adds that grilled vegetables are great eaten alone but recommends you always grill too many because the leftovers make great sandwiches (nice whole grain toast, goat cheese and warm roasted veg) Pasta (Saute some minced garlic in olive oil, added diced grilled veg and cooked pasta. Toss until everything is coated with the oil, sprinkle with you choice of cheese) or layer into a lasagna). It’s been almost a year since I had to go ‘gluten free’. Like any major change it feels over-whelming at first but in the end you just have to get on with it. Instead of wallowing through my challah free days, crying over cinnamon rolls or lamenting the beautiful dark rye I took it as a challenge to eat without ever feeling deprived. Big bread filled meals just aren’t on the menu in this house anymore, pizza nights are now a homemade and I can now make rice noodles that I challenge you to see a difference with the wheat based pasta. One of the biggest changes has been the frequency we eat rice. Some people think rice is boring, I promise you that is not the case. The simplest change of cooking it in chicken or vegetable stock instead of water makes a world of difference. Here are a couple of the favourites around this house these days. This has an Indian taste about it but without the spiciness. It is a great way to introduce those flavours to the little ones. Serve with a curry, add to a tomato soup or serve with a fried egg on top and some soy sauce for breakfast (I know it sounds weird but it is delicious and kids love it). No matter what always cook too much rice. I never make less than 3 cups (uncooked). I love left over rice and all the possibilities it holds. As far as I am concerned left over rice in the fridge means dinner is half done. Fried rice is one of the truly quick and easy options around this house and a great way to use up leftovers. Add the zucchini, garlic and shrimp stirring frequently. You don’t want your garlic to burn. Once the shrimp is completely pink add the rest of the coconut oil, and the rice. Stir well until completely combined. The rice will absorb most of the oil and it will start to pop and fizzle on the bottom of the pan. Let this happen. Stir up the slightly brown pieces from the bottom and mix them into the rest of the dish. You can let this happen as many times as you want until it is as ‘toasted’ as you like. I suggest not to toast it too much if you have smaller kids. It is in the end here that you can throw in any leftovers you may have. Cooked broccoli, chicken, beans, any veg. Use up any leftovers as replacements for any of the ingredients to make it your own. I recommend coconut oil for this because I love the coconutty taste for this dish but it isn’t necessary. You can replace it with olive oil but turn the heat down a bit. Olive oil has a lower smoking/burn point then coconut oil and once heated it not a healthy fat anymore, unlike coconut oil. I love the simplicity of rice pudding. Ingredients you almost always have around the house, throw it in a pot…stir occasionally. Eat warm now, eat cold later. Rub the inside of an oven safe dish with some of the butter. Add the rice, butter, milk, sugar and salt. At this point you can choose what flavour you want the pudding to be. Add raisins and cinnamon OR some orange zest and nutmeg OR a vanilla bean split lengthwise OR go a tropical route and replace one cup of milk with coconut milk. Put in the oven lid off and bake for 45 mins. Take the dish out and stir gently with a wooden spoon. Put it back in the oven. Take it out in 30 mins and you’ll notice that a light brown skin has started to form on the surface. Stir this back in. Return the dish back to the oven (with the lid on if you don’t want a skin to form) for 1 to 1 ½ hrs. Rice pudding can be eaten warm or cold, it can be served alone or with fresh fruit. If you chose to use coconut milk it is wonderful with canned or fresh pineapple. The hardest part of serving rice to the little guys is cleaning up the mess on the floor. Until spoon handling is down, try to feed them out on the patio or in the yard this summer. If you saw how fat our dog is you would see how we solved that problem! Growing up I always wanted a fish tank. I’m not sure why I never got one, maybe because we had cats but as soon as I moved out on my own I got one. I ended up getting myself a 25 gallon fresh water tank. I had a bunch of unusual fish and freshwater plants. It was beautiful. At one point I had an Angel fish called Angel and a small puffer fish called Buffy Puffy……so? In a large bowl mix together the maple syrup, soy sauce, sesame oil, garlic and ginger. Slip rinsed and patted dry salmon fillets into the marinade. Let marinate for a couple of hours in the fridge. Don’t leave for too long or the salmon will start to ‘candy’. Although still very eatable and delicious some of the texture of the fish is lost. No matter how many vegetables my kids get into them I always think that they should have more. I try to get some into every meal whether they know about it not. There have been many ‘cook books’ written in the last few years about hiding vegetables in dishes and although this guarantees they are getting some into them (albeit very little generally) I also think we create so much of the stigma ourselves with our assumption that they just aren’t going to like them that we create the fight before a fight has even started. I remember while I was pregnant sitting at a friends dinner table while she tried to get her 3 year old to eat. All the bribing and begging she was doing while he danced around the room claiming it was “yucky” and “gween”. She looked at me exasperated and asked if I had any ideas…..I shrugged…”make it all green”…I meant it as a joke really but the more I thought about it the more I liked the concept. Once the introduction of solids started for my own kids, I kept this idea in mind but I also picked my battles and I still do. After a few attempts, cooked in different ways, if they sincerely don’t like something I don’t make them eat it (I think about how mad it would make me if someone kept trying to make me eat okra). I won’t walk you through what didn’t work, your kid’s tastes are going to be different than my kid’s, but I will give you some of the success stories and you can try them to see if they work for you. I started by putting parsley in everything, fresh or dried. I put it in scrambled eggs, mashed potatoes, rice, all soups, stews, and casseroles. Everything has green in it. The idea behind this is that there is no association with green being something yucky and being ruled out completely. sandwiches, rub on chicken before roasting, lightly cover boiled potatoes with it, in mac and cheese, or my favourite thing, a little blob of it on a cream cheese or goat cheese covered cracker. In the winter time I buy pesto. Try the refrigerator section brands in a good market and try to keep to the basic ingredients. I buy one I recommend that has basil, garlic, oil and ground up sunflower seeds. NO one believes me when I say my kids love these. Maybe they do in part because they associate ‘chips’ with party food and they keep eating them so I keep making them. Wash a bunch of kale. Remove the main stem and tear up the leaves in ‘chip’ size pieces. Spread evenly on a cookie sheet, lightly drizzle about 1 tbsp of olive oil and liberally sprinkle with salt. Put in a 325 degree oven until crispy and dried out. You may have to turn them over if there is any ‘chip’ over lap on the sheet. It takes about ½ an hour – to 45 minutes. There are so many things that make babies so yummy. Soft round bodies, sweet faces, silly expressions, toothless grins, the giggles, the tiny clothes, the garlic breath……..or is the last one just me?? There are few things more satisfying to me as a mom than seeing empty plates after a healthy meal. My twins are now three years old and I am trying to get them involved in the preparation of meals. Introducing foods before and after they are cooked. Letting them taste, smell, touch, stir things, and dip little fingers. I don’t think it will leave an indelible mark if they don’t have the ‘right’ toys, a fancy video gaming system or labeled clothing but I think enjoying the taste of real foods, being involved in the preparation and the joy of having a wonderful meal, that they helped make, will stay with them a lifetime. 1. Peel away the loose outer layers of the garlic bulb skin, leaving the skins of the individual cloves intact. Then cut off 1/4 to a 1/2 inch of the top of cloves, exposing the individual cloves of garlic. 2. Place the garlic heads in a baking pan; I like using a lasagna dish. Drizzle a couple teaspoons of olive oil over each head, make sure the cut open end of the garlic head is well coated. Cover with tin foil. Bake for 30-35 minutes, or until the cloves feel soft when pressed. Don’t let it burn, burned garlic is bitter. 3. Let cool completely. If you manage to not eat them all right now, squeeze the bottom of the bulb and let the soft creamy cloves squish out. Put all the cloves into a glass jar or glass Tupperware (I don’t like plastic for long term storage and the garlic will make the plastic so garlicy it will make it unusable for anything else) Once all the cloves are in the container pour in the remaining olive oil. You want to completely cover the garlic. Depending on the size of your bulbs and the shape of your container this could take varying amounts every batch. Once covered tap the bottom and sides of the jar trying to release any air bubbles. Garlic stored like this will last a couple of months refrigerated. Keep an eye out for mould which will happen if any garlic is too close to the surface. Small white dots may appear in the oil and the oil will thicken, this isn’t mould and nothing is wrong, this is the fat in the oil hardening because of the cold. It will return to normal if you allowed the container to come to room temperature. There are a million ways to use this garlic (just spread on hot buttered toast with a bit of salt is one of my favourites) but I thought I would give you three very different sauces I make often that make kids eat EVERYTHING….I swear!! But first a lesson in Tahini. Tahini is like a peanut butter but made with sesame seeds. Some people are very familiar with Tahini (sometimes spelled Tahineh) especially if you enjoy Middle Eastern foods. It is often served as part of a hummus dip or a sauce in a falafel. Two of these dips include Tahini and I do recommend getting certain kind. Make sure that you are getting a brand that is Tahini only, not already a Tahini dressing. The only ingredient should be sesame seeds. You can often find it in the ‘ethnic’ or organics sections of the grocery store. Sesame seeds are a great source of non-dairy calcium. Once combined it will be thick. We are going to water it down to the consistency of cold maple syrup. Start slowly, adding water little by little. This is easier in a blender. Once it is the right consistency it is ready to eat. Serve cold. Try poured over broccoli (my kids LOVE this), any vegetable and rice. Keep refrigerated for up to 2 weeks. I love hummus and so do the kids. I am always amazed by how much of it they will eat. 1. 1 tin of chickpeas drained and rinsed. Try dipping steamed carrots, asparagus, or using it as a sauce with baked salmon. It also makes killer potato salad. My twins were conceived through IVF. It is not something that I am shy about or ashamed of. It is something that I am very proud of. I feel they are ‘the hardest worked for’ kind of kids. I was positive the IVF wasn’t going to work (I read the stats!) that I went back to school full time, thinking that the sting and hurt of the IVF failure would be out weighed by the joy and anticipation of a new career. But I did everything that might improve the odds, acupuncture, herbs, eating pineapple the day after transfer, positive thinking, and meditation ….everything!! I needed to feel like I was somehow participating, being pro-active, and having some sense of control. I have never been very good at leaving things up to fate. In the end we had a very successful cycle. 23 eggs were retrieved before stopping, although there were more, and the clinic called daily to update us on fertilization. Numbers usually slowly decline as some don’t make it any further but every day we had more. On day 3, one of the possible transfer days, we had 18!! We decided to wait till day 5 or in IVF lingo “go to blast”. They called us on day 5 asking to delay another day, they had over-booked the day and we had 16 blastocysts. They felt we could wait. I didn’t mind, it was April Fools Day and I was afraid of what the prank might be! The next morning we discussed with our doctor our transfer options. Of the 16 ‘blasts’, they felt that 9 of them would create a pregnancy. Because of my age we were given the option of transferring one or two. Guess how many we chose? After the transfer we froze the other 7 eggs. It didn’t mean much at the time other than the possibility of trying again without needing to do a whole cycle but now that we have the twins and I know what parental love is, I guard those eggs like they are my children. They are my babies, my frosties, my popsicle babies, my frozen muffins. Slowly add dry to wet and stir until well combined. I know not everyone is gluten free (like me) but I am including this option for a couple of reasons. It is completely sugar free. It uses a very healthy fat which I think people know very little about and will be surprised by. And it benefits everyone (including the planet) to introduce ‘other’ grains into our diet and cut back on wheat. Give this a try……I dare yah! Slowly add dry to wet. Once it is all mixed together if it seems a little dry add a little more juice/water a tbsp at a time until smooth. Stir in 1 peeled and grated apple and 1 peeled and grated carrot. Spoon into greased muffin tin or use paper muffin cup (easier I think) and bake for 25 minutes or until a knife comes out clean. Let cool before freezing. The results of my blood test came 3 weeks into a degree program. I was pregnant. The degree program that we agonized over, scrimped and saved for, so I could go back to school fulltime and we could drop to a single income. I found out while standing in the hallway on my cell phone between classes. An ultrasound a couple of weeks later, it was TWINS!! My husband and I left the clinic like zombies, got in the car and started the drive home. It wasn’t until half way home that one of us said something “The dog is going to freak out!”….it wasn’t until the next day that I realized I had left my purse at the clinic. We all have some ideal of what kind of parents we will be and I think all of us spend the first while trying to live up to that impossible goal. Parents of multiples have a faster learning curve that some stuff just ‘ain’t gunna happen’. After slowly crossing things off the list like daily showers and mowing the lawn with any regularity, my husband and I realized that two important things were left, that our kids slept well and ate well. So those became the daily goals. Preserving naps even if it meant we couldn’t go to everything we wanted to go to and home cooked meals. Everything else was just gravy………but really good home made gravy. It is from this intention, of showing love ‘nutritionally’ that these recipes are inspired. It also helps that I spent 16 years working in the restaurant business. We try to eat fresh/organic/local and seasonal when possible and all my recipes are simple, healthy and developed for the whole family to eat. I do not run a diner; my kids eat what we eat. There are only minor alterations on the recipes depending on the age of your kids. I can only hope that somehow making meal time a bit easier for you might find you the time for that bubble bath we all long for and more than deserve. So now that fall has officially started and with it Cold and Flu Season!!! I thought I would start with something to warm your bones, keep you healthy or get you healthy again and only uses only one pot! 2 Cups Diced carrots, for soups I cut them into quarters lengthwise and then slice making ¼ moons. Over medium heat in a large soup pot heat the olive oil and sauté the carrots and onions (or leeks) with a pinch of salt . Stirring until they are soft and the onions are translucent, about 5 minutes. Don’t let them brown. Add the garlic and ginger and sauté until you can smell them, usually about 2 minutes. Stir in the parsley and thyme and then add the chicken stock and water. Turn up the heat to Medium-Hi til it comes to a boil. Add the lemon zest and rice stirring for a minute or two so the rice doesn’t stick to the bottom. Once it starts to simmer again turn the heat back down and put the lid on and let cook for 10 minutes. Add the sweet potatoes and the whole rinsed chicken breasts. Let the whole pot simmer lid off till the chicken is cooked through, about 12 minutes then pull them out and let them cool for a couple of minutes. For younger kids, dice or mince this chicken with a knife. For older kids and adults I recommend shredding it with two forks which is easy to do even if they are hot. Add the chicken back into the soup pot and let simmer until the rice is fully cooked (5-10 mins depending on your choice of grain) Once done add the lemon juice and the soup is done. I started serving this soup to the kids not as a soup but pulled out the contents with a slotted spoon. As they have gotten older and more proficient with a spoon they now eat it themselves. They love to dip toast fingers in it. The adults can add more salt and pepper if they want. We like to add dried chilies to give it some kick.